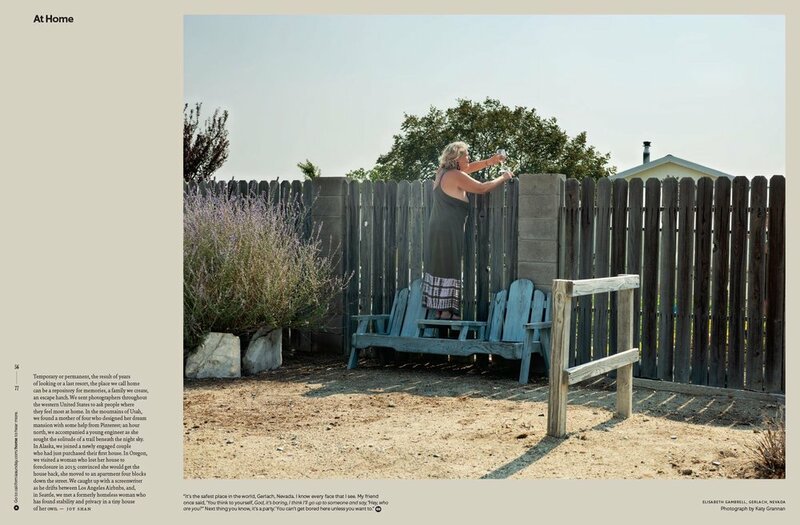 The California Sunday Magazine’s December Issue is the publication’s first-ever photography issue and focuses on the concept of home in the American West. This special issue also features an off-the-page extension with an exhibition that extends upon the “At Home” cover story at the Aperture Foundation Gallery in New York City (December 6, 2018 to January 4, 2019). Read on to hear from Photography Director, Jacqueline Bates, about the issue and the exhibition. SPD: Why did you decide to dedicate this issue to the theme of home in the American West? Jacqueline Bates, Photography Director: This year, we dedicated our themed issue to how people define "home" across the American West. This theme feels particularly urgent in 2018, when wildfires are destroying entire communities, housing costs are rising rapidly, and contentious immigration policies are dominating the news cycle. We focused on the American West because it's one of the regions (in addition to Asia and Latin America) that we cover at The California Sunday Magazine; we felt it was an intimate enough area for us to dive deep into, while still representing many different perspectives of home. SPD: This special themed issue is also California Sunday’s first ever photography issue. What was the process like putting this issue together? JB: We've always seen photography as its own form of storytelling, but it's really exciting to have it be the sole driver of this special issue. We commissioned 30-plus photographers for the issue. Unlike a typical California Sunday issue, there's very minimal text. This was a great opportunity for both photographers and our team to think creatively without text as a guide or jumping-off point. SPD: How were the photographers chosen and how did you decide what states/stories they’d cover? JB: We regularly work with a mix of established photographers and up-and-comers in each issue. In this issue, you'll find photography by Jim Goldberg, who has been working with experimental storytelling for 40-plus years and has shown his work in museums and galleries around the world, next to photos by Pixy Liao, an emerging photographer whose California Sunday commission was her first venture into editorial work. To figure out which states and stories to cover, we looked at all the states west of the Rocky Mountains and then determined what kinds of interesting, hidden stories of home we might be able to glean from each. After assigning photographers to a specific region, we asked them to wander and dig deep for stories that may be otherwise overlooked. SPD: Were there any photographers in particular that you were really excited to work with? JB: I was so thrilled to finally have Katy Grannan photograph for the magazine — we've been in touch for a long time (she showed her first feature-length film, The Nine, on stage at Pop-Up Magazine back in 2016), but she hadn't shot for the magazine, so this was a really wonderful first commission. We're also thrilled to print Taylor Kay Johnson's work, a recent CCA grad, whose work we first featured on our Instagram account when we did a takeover with her graduating class. SPD: California Sunday has a small creative team. What was the collaboration process like in putting this issue together? JB: Creative Director Leo Jung, Art Directors Annie Jen and Supriya Kalidas, Photography Editor Paloma Shutes, and I spent a long time working together on what this issue should look like. It's been over a year in the making! We held many a brainstorm session and also asked the entire team for suggestions and input. Led, of course, by our amazing Executive Editor Raha Naddaf. And a special shout-out to Joy Shan, our associate editor, who led the research process on where in the American West we should be focusing on for our "At Home" photo essay. Aside from the issue, we've also been focusing on putting on a gallery show! With the help of Supriya and Production Manager Thomas Bollier, curating the show has been a fun and challenging off-the-page experience. SPD: What part of the photo issue are you most proud of? What is your favorite photo or story from this issue? JB: I'm especially proud of our cover photo essay, "At Home." For this sweeping story, we sent 19 photographers across the western U.S. to ask people where they feel most at home. We encountered a musician who remembers home as the elementary school where he learned to skateboard, a mother who built a bathroom from scratch for her and her 10-year-old daughter, a DACA recipient who just purchased his first house, and many others. All the photos really come together to show how many different versions of home there are. It was a big project, but I'm so proud of it. It's also the basis for our exhibition at Aperture Foundation. Think of the gallery show as an extension of this photo essay, a magazine story you can walk through in real life. SPD: Along with the issue, California Sunday is doing an exhibition of these photos at the Aperture Foundation in New York City. How did this partnership come together and why did you choose to extend the photo issue by doing this exhibition? JB: We at California Sunday and our friends at Aperture Foundation share a similar mission when it comes to photography: We believe photos are their own form of storytelling. With the magazine, I'm always thinking of ways to experiment and collaborate with like-minded photography institutions, and this was the perfect opportunity. We also wanted to make these stories a multimedia experience; for instance, each story is accompanied by audio footnotes so you can listen to the subjects in the photographs directly (since there's minimal text). In the case of the "At Home" photo essay, that meant taking it to a new level and turning our cover story into a gallery show at Aperture. It's a really interesting way for our readers — and new audiences who are just passing by the gallery — to interact with these photographs and stories. They can also choose to listen to the accompanying audio on their phones. We're excited for people to wander throughout our cover story in real life. And, the exhibit is sponsored by Google Pixel, another exciting photography-first partnership. 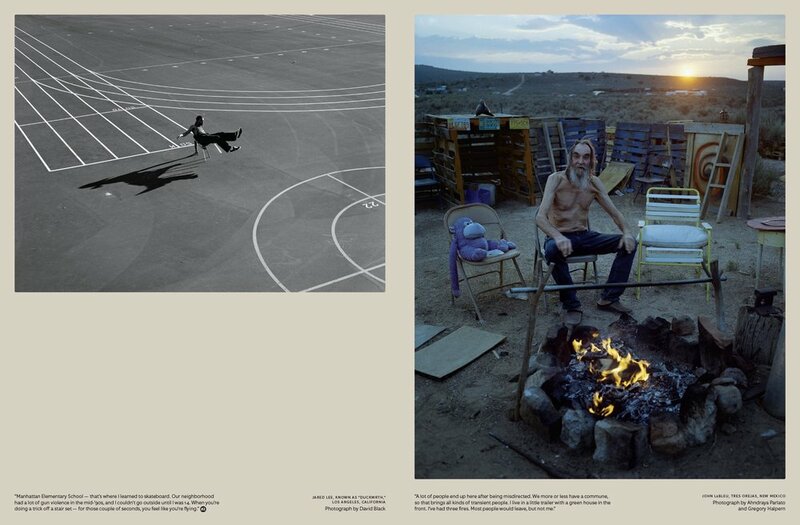 View California Sunday’s At Home: In the American West exhibition at the Aperture Gallery (547 West 27th Street) in New York City from December 6, 2018 to January 4, 2019. This exhibition is free and open to the public. There will also be an opening reception on Thursday, December 6 from 6:00-8:30pm where you can meet the California Sunday team.